Selling only one of the machines of your choice. 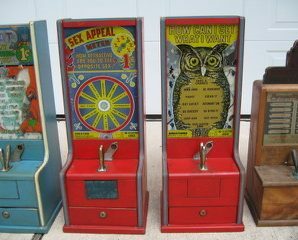 The Wise Owl 1940″s Exhibit Supply Co. A rare Penny coin-operated arcade game. Insert a penny and the light selector spins around clockwise and eventually starts to slow down and then stops, on a name. The lighted name stays lighted for about 10 seconds after it stops, then goes out. The machine needs bulbs and some minor adjustments for it to operate like it should. Call with any questions. 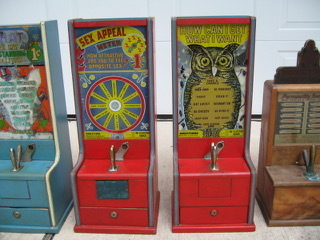 Your Fortune Told Astrology Machine Himebaugh Mfg.